A "classic" cowboy herds cattle on horseback. The dress required goes with the job which includes a cowboy hat, bandana, boots and spurs. 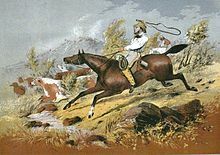 In Australia what we call ranches in the United States are referred to as cattle stations and the workers, or cowboys who tend the cattle are called Jackaroos. There are many cattle stations to be found in the outback of Australia. The lifestyle of the Jackeroo is difficult and dangerous. The climate is arid. The location is isolated. Injuries are common and medical help is not widely available. "A jackaroo is a young man (feminine equivalent jillaroo) working on a sheep or cattle station, to gain practical experience in the skills needed to become an owner, overseer, manager, etc. The word originated in Queensland, Australia in the 19th century and is still in use in Australia and New Zealand in the 21st century. Its origins are unclear, although it is firmly rooted in Australian English, Australian culture and in the traditions of the Australian stockmen. An origin from an indigenous language term for 'a wandering white man'. Another suggestion (1885) was for an origin from the aboriginal word for a 'pied crow shrike', a garrulous bird, which the strange-sounding language of the white settlers reminded them of. Meston explained his position in a newspaper in 1919. By 1906 Immigrants into Australia were often called Johnny Raws. From that it became Jacky Raw. A jackaroo (sometimes spelled jackeroo) Is a young man learning experience on a pastoral property. In the English language 'Jack' is compounded with a lot of words, and in the early pastoral days it was compounded with the 'roo' in Kangaroo to indicate, perhaps, the aimless rushing about of the inexperienced station cadet. The Encyclopaedia of Australia stated in 1968 that it is 'most probably a coined Australian-sounding word based on a [person] Jacky Raw' Jackaroos (Jacky + Raw) were often young men from Britain or from city backgrounds in Australia, which would explain the pejorative use of 'raw' in the sense of 'inexperienced'. Arguably the most authoritative voice in 2010 was that of The Australian National Dictionary Centre of the Research School of the Humanities at the Australian National University, which provides Oxford University Press with editorial expertise for their Australian dictionaries. They have explained their reasons for making no final judgment, and raise another possibility, that 'jackeroo' is derived from an aboriginal word for 'stranger' rather than for a 'pied crow shrike'. The spellings 'jackaroo' and 'jackeroo' were both used from about 1850 to at least 1981. In 2010, the more commonly used spelling was 'jackaroo'. However, between the years 1970 and 1981, a sample of Australian newspapers referred to 'jackeroo' 18 times and 'jackaroo' 29 times." During the time of The Old West in America Australia also had cowboys. They were referred to as Stockmen. "In Australia a stockman (plural stockmen) is a person who looks after the livestock on a large property known as a station, which is owned by a grazier or a grazing company. A stockman may also be employed at an abattoir, feedlot, on a livestock export ship, or with a stock and station agency. Stockmen who work with cattle in the Top End are known as ringers and are often only employed for the dry season which lasts from April to October. A station hand is an employee, who is involved in routine duties on a rural property or station and this may also involve caring for livestock, too. With pastoral properties facing dire recruitment problems as young men are lured into the booming mining industry, young women from the cities are becoming a common sight on outback stations, often attracted by the chance to work with horses. ..."
William Strutt's Bushrangers on the St Kilda Road, painted in 1887, depicts what Strutt described as "one of the most daring robberies attempted in Victoria" in 1852. The road was the scene of frequent hold-ups during the Victorian gold rush by bushrangers, mostly former convicts from Tasmania (then known as Van Diemen's Land), which collectively became known as the St Kilda Road robberies. The Poem, "The Man From Snowy River" is magical and was made into a movie. My husand, Bill and I, rode in the area where the movie, "The Man From Snowy River", was filmed. I will tell you that the area is beautiful. We rode with a group of people for one week. The word control of one's horse was not in anyone's vocabulary. The horses were not well trained--bucking, rearing and kicking--and the owner of the horses was really abusive. We were watching him break one of his young horses one evening and had to leave as it was a sight NOT to behold. I might add that the owner was falling down drunk and really heavy handed with the whip! He drank heavily every evening. Our riding, at his ranch, was not a good experience. We were glad to get out alive and in one piece! I might add that we decided to leave early and did just that.